If you have lived in North Queensland, then you would have eaten a pie or two. There have been many debates on which town sells the best pies. Ask any truck driver and they would be able to tell you how they alter their route to fit a quick stop at the best pie shop along the way. The meat pie is an icon for North Queensland and all my life it has been a staple part of my diet. Since I have lived all over this wonderful state I have tasted many varieties and have a tale or two to spruik where to go and what to buy. When in Hughenden I remember the cattle farmers buying up dozens of pies, which were stored in flat brown boxes, to be driven back to the farm and if I was lucky, one was given to me for lunch. There are the Cranston Pies from Rockhampton, which bring back memories of pie with peas and tomato sauce for lunch while in high school. Byrnes Pies from Mackay have held a rivalry with fellow Central Queensland pie shop Cranston Pies, I personally like both equally. Inglewood bakery was another pit stop for a sausage roll on the long drive out to Goondiwindi. Yatala on the Gold Coast is home to the big pie and I’ve sampled a few from there too while on holidays. Under my building at work is a privately owned pie shop, which makes an ok pies and on cold days when I’ve had a late start; I splash out and buy a pie for lunch. The trouble is there pies are slowly going from ok to below average. The couple that runs the shop know when I rock up and indulge in my pie fetish; I eat a steak pie with mushrooms. Last week, I gave myself a stern talking to, because I can’t keep eating below average pies anymore. The couple who run the store is adorable and often mentions to me how business has been slow. I just smile nod and quickly move on because I don’t have the heart to tell them, it is because the quality has slipped with the pies. After giving myself a good shaking for eating food I don’t like because I feel sorry for someone is not helping. Either speak up or eat somewhere else. So I ate somewhere else, which was right next door at the salad shop. Somehow I thought that by eating a salad I could justify not eating a pie and the couple would see I was on a health kick. When I was waiting to order my salad, i shamefully kept looking over to see if they saw me standing in line. Oh how my conscience was hurting with the betrayal. My mantra was heaps of lettuce and baby spinach I was about to consume was going to clean my soul of being a coward. Today I forgot my lunch. 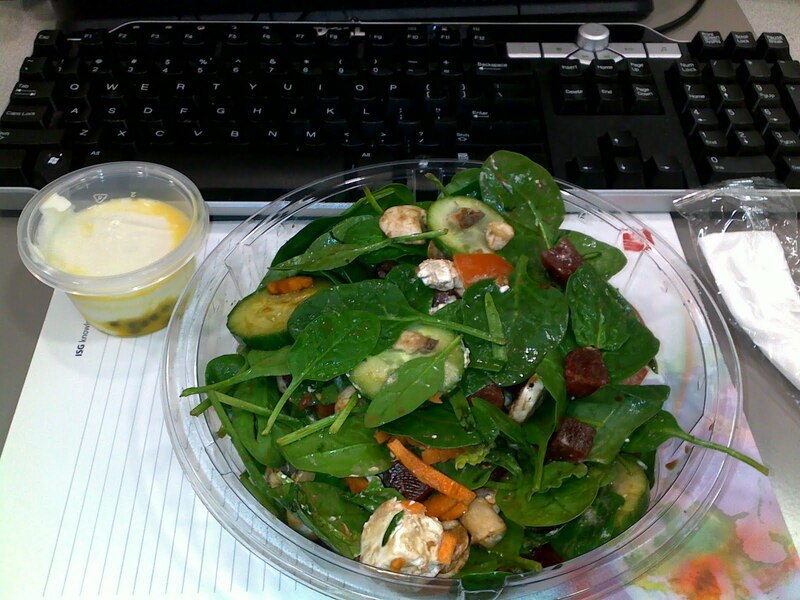 I really, really wanted to eat a salad and considered walking 4 blocks away to buy it. Except my conscious won’t let me and the sting of my leafy betrayal was etched forever in my subconscious. Instead I brought a pie, which only had 2 pieces of meat in it and pastry that has way to much margarine. As I munched down my pie, I vowed that I will never forget my lunch again.